I'm not so sure if I am. I do not like waking up. No, I do not. But I'm a type A first-born. Being in pajamas at 11am -- even on a weekend morning -- makes me panic a little.... Oh no! The day is practically over! Oh no! I should get up at 5am tomorrow! Yes, I'll totally do that! I'll never actually get up at 5am. Not a chance. But I do really like good breakfasts. So, in the name of breakfast, I might get up just a little earlier than usual. 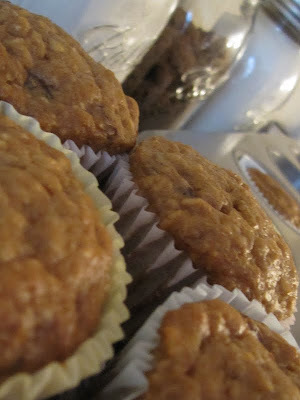 I woke up today, knowing it was a muffin kind of morning. There are only a few things that make me jump out of bed. Strong, hot coffee. Christmas. A new running route on a sunny morning... followed by coffee. And excuses to bake breakfast. Cinnamon rolls, challah, or baked eggs... it doesn't really matter. Five minutes later, I was out the door and stumbling down the street, for coffee and a box of brown sugar. Was waking up early worth it? So when you're lying in bed doing a cost-benefit analysis of hitting the snooze button one more time, these muffins might just give you the motivation to get up. 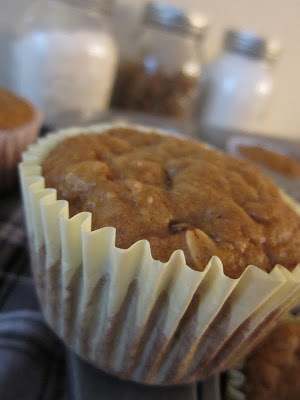 The muffins are fluffy, moist, and packed with oatmeal and raisins... and just a little brown sugar. After all, Mary Poppins always said a spoonful of sugar makes the medicine go down.... and sometimes we need a little something special to make mornings better. Stir the oatmeal, cinnamon, nutmeg, and raisins together with a fork in a large mixing bowl. Add the yogurt and 1/2 cup of the milk and stir well. Cover and place the bowl in the refrigerator overnight (at least 12 hours). Position an oven rack in the top third of the oven and preheat the oven to 350 degrees. Line a muffin pan with liners or grease the pan with butter. Add the remaining 1/3 cup of the milk to the oatmeal and stir well. Stir in the brown sugar and then the egg, mixing well after each addition. In a separate bowl, combine the flour and the baking soda and stir together with a fork. Add the flour to the oatmeal all at once and mix well. Fill the muffin cups about 3/4 full and bake for twenty minutes, or until a toothpick inserted into the middle of a muffin comes out clean. Let the muffins cool for ten minutes on a wire rack, then serve. Makes twelve medium muffins. Love that "cost benefit analysis of hitting the snooze button once more"--I think I know someone who could be lured downstairs by the aroma of these delectable muffins. Love the photos--and the jars! Thanks! These muffins are great -- they're just a little bit sweet and, though they have a taste like other oatmeal or bran muffins, they're much lighter and fluffier.